Ever wonder why offshore island arcs should form at random spots in the oceans? No? Don’t worry, its a far fig newton. We offer here the suggestion that the locations are not random, that island arc trenches and probably spreading ridges and transform systems as well, form where tectonic stresses exploit a hot and thin weakness scribed in the crust by recent passage of a hot spot. 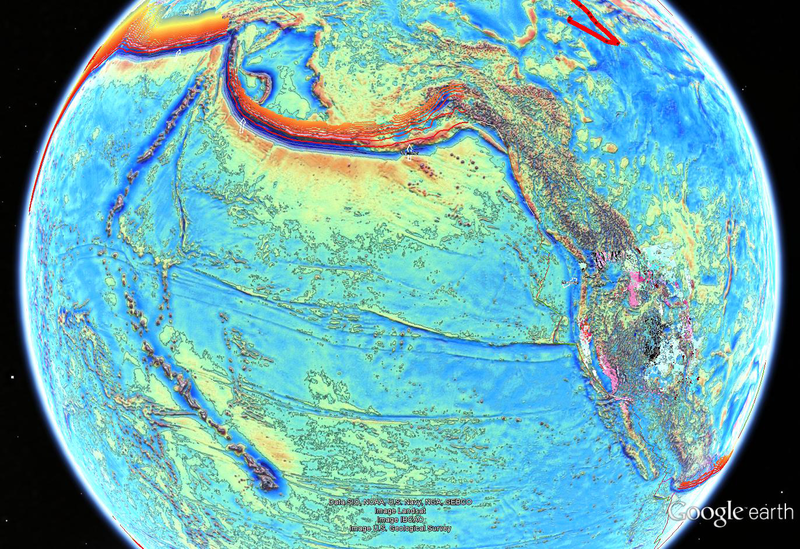 Check out the Hawaiian/Emperor seamount chain in relation to the North Pacific trench systems on a gravity map. This seamount chain is an island arc/trench system waiting to happen. If push comes to shove the western concave side will fail and begin sliding under, forming a Benioff zone like the ones shown by red depth contours in the nearby Aleutian trench. The Hawaiian hot spot is essentially a cutting torch from below. It is a point source of volatile components from the mantle. As it burns through ocean crust it reprocesses and further fractionates it leaving a slag of lighter and more buoyant islands in its wake. An island arc really couldn’t ask for more. The volcanic conduits are already in place! If compressive forces should cause the Western Pacific ocean floor to start sliding under, it would begin distilling hydrated ocean floor into aluminized intrusives and granite, and possibly join the island arcs that have been accreting to western North America since the Cambrian. This entry was posted in Geography, Geology, Gravity Anomalies, Seamount Chains as Incipient Island Arcs and tagged Cambrian, Hawaiian Islands, Pacific Ocean, Wadati–Benioff zone. Bookmark the permalink. Nice short piece on seamount and island arc formation.